Brother Marcus (born May 30, 1967 and also known as Sister Elisha) is a character in the 2D Universe who appears as a main character in Grand Theft Auto 1. He is the leader of The Brotherhood of Jah Army of Love in Vice City and controls almost all of the drugs trade in the city. 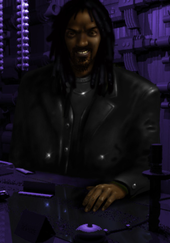 Brother Marcus was born on May 30, 1967 and, by the time of Grand Theft Auto 1, had become the leader of The Brotherhood of Jah Army of Love. He had gained an extensive police record with past offences being bombings, executions, woundings, various Ninja high jinks, Ganja propaganda, fraud, pilfering and dealing narcotics. He and his gang had also been involved in a 'campaign of terror' for seven years prior to GTA 1 against the 'Babylon' (agents of the American government) and controled almost all the city's drugs trade operating a 'one for you - two for me' method. His VCPD record also states that on Saturday evenings he dresses up as Sister Elisha. In GTA 1 he hires the protagonist initially to kill a man using a car bomb and stop a Cuban drugs shipment. After this, with the protagonist having proven themselves, he has him kill some Babylon scouts, kill a high priest before a radio interview, to help Brother Leroy and later Brother Zachary, to destroy a Babylon limousine, destroying three Babylon vans, killing some Babylon agents in a car park and later in a graveyard. While the conflict with the Babylon intensifies, the protagonist is hired to kill Spindly Jim. After this the protagonist helps the Brotherhood take control of Vice City, kills a Babylon agent who killed Brother Aerol and to kill an agent tasked with killing Brother Maelcum. The protagonist also blows up a car, with Judge Alberts inside, outside a police station in Vice Beach, rescues a mother of a Brotherhood gang member and then helps steal a number of Babylon objects while posing as an agent in a Tanker. This page was last modified on 17 October 2013, at 16:17.